A spacious Edwardian Gabled house within this friendly family orientated street known for its good sized gardens. It features interconnecting reception and kitchen spaces with oak parquet flooring and substantial outside covered deck running off the kitchen and out into an established west facing garden. Upstairs on the first floor there are three bedrooms and a family bathroom, and a master bedroom with good storage areas at the top with en suite shower room. The house is situated at the northern end of Dordrecht Road near the junction with Uxbridge Road - it is a few minutes walk from both Wendell and Acton Park, as well as outstanding local schools such as Southfields Primary and the new Ark academies, including Ark Byron on The Vale. Askew Road is also within a short walk, and the shopping and transports hubs of Hammersmith and Westfield are within easy reach; the 607 bus route east along Uxbridge Road provides the fastest access to the Central Line tube. Stamford Brook or Turnham Green Terrace tubes are an approximate 15 minute walk. 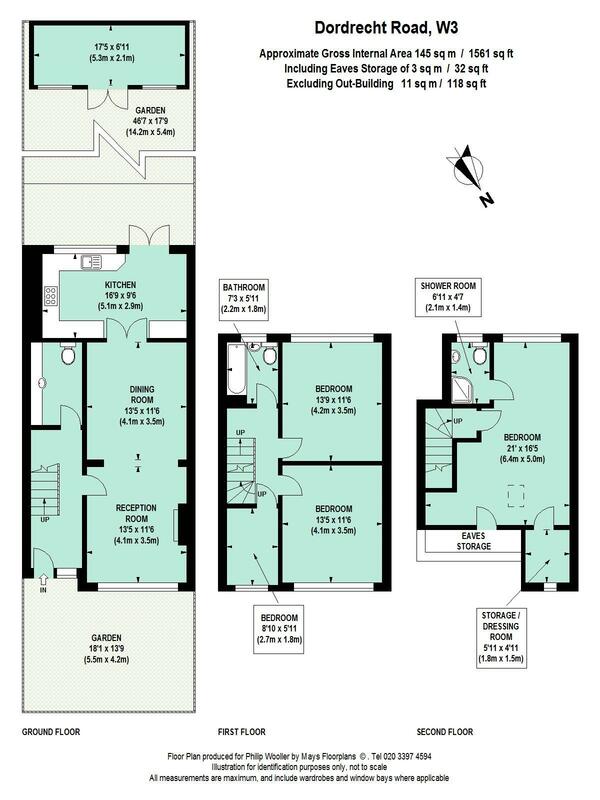 1561 sq ft / 145 sq m approx.